This one’s a bit long, so please bear with me. Our friend Mark Irons is nearing the end of his amazing journey on this Earth, and I need to write a bit while he’s still here. Hope cried while writing her post on Mark’s CaringBridge site, and I got a bit weepy while writing this, but it’s all good. While Mark’s current condition is lamentable, it’s still a gift that it’s happening now, at age 46, instead of his original projected lifespan of 10. I shudder to think what my life would have been like without knowing him. I first met Mark through Hope, who wanted me to meet her friend living down the hall on State Quad at SUNY Albany. Mark was clean-shaven and had short hair at the time, which I’m sure seems odd to those who didn’t meet him until after he grew his hair and beard out. The first thing that I noticed when we walked into his room was that Mark had a hand coming out of his wall. Really. There was a plaster sculpture of a hand that appeared to be growing out of his wall. Very cool. Then Hope showed me how he was her “Mark doll.” He would stand there and she would pose him like a bendy figure. It was then that I realized that Mark was a very patient person, and that I also realized that I was glad that she had him because I wouldn’t stand for being a “Mark doll.” I’m not sure when I found out that he had Cystic Fibrosis, but it was very shortly after I met him. Mark and I were fellow computer geeks, but he was much deeper into it and much more intelligent that I. I couldn’t begin to comprehend the fractal geometry and artwork that he was exploring. Yet he was always patient when he tried to explain it. We shared a love of science fiction, but I couldn’t match his depth of knowledge and understanding of subtext. Hope and I spent a lot of time with Mark over the years at SUNY and for years afterward (Hope much more than I). Mark was even the diversion for Hope’s surprise 25th birthday party. We had successfully convinced Hope that she had figured out that her surprise was going to be celebrating at a local upscale hotel’s New Year’s Eve party on her birthday (she’s a New Year’s Eve baby). She had no clue that the real surprise was a big party at our house the night before, so that we could count down to the beginning of her birthday for a change. Mark was assigned to keep Hope busy while we decorated the house, got everyone’s cars parked a distance away, and got all of the out-of-town guests in. He convinced her that he needed to go shopping for something, and he kept her out for hours. And hours. We were ready and waiting, with lots of food and music and entertainment ready to go, and he got her to go to dinner at Friendly’s for even longer. He just didn’t want us to still be getting ready when they got back. (We didn’t have cell phones back in 1990 to check in.) But they did come back, and the party was great. Hope remembers wondering what was taking so long during the entire outing, even though she enjoyed spending time with Mark. Mark didn’t attend our wedding, though he didn’t give a reason. A couple of years later, he told us that he needed to have a conversation with us, and that it included the reason why he didn’t attend the wedding. We thought that maybe the cystic fibrosis had gotten worse and that he was approaching the end, or some other earth-shattering calamity. Over dinner, we were talking about some awkward situation or another, and he said “that’s the kind of reaction I usually get from people when I tell them I’m gay.” Hope & I continued eating and talking, then we realized that Mark was just staring at us. “Ohmygod. Is THAT what you were so afraid to talk to us about? Really?” It turns out that he had realized that he was gay but was uncomfortable about being closeted and didn’t think he’d be comfortable at our celebration. He didn’t want to create discomfort at our event because of his own discomfort. After we disabused him of the notion, we had a very good conversation about how he realized that he was gay, how he felt about it, and what effect that was having on his life. He seemed more relaxed that he had in a long time. We were so glad that he was able to open up again. Mark began to really thrive and become more HIMSELF. He was really more at home in his own skin that anyone I had met, especially someone whose interests were largely out of the mainstream. Mark was a deep thinker. He really thirsted for meaning in everything. Probably because of the cystic fibrosis, and the fact that he was aware of his own mortality and the value of every day he was living, he seemed to get more out of each day than anybody else. His questing thirst for knowledge was amazing. He was always trying to learn more about something, on a variety of diverse topics. Mark was consciously thoughtful and caring, and was always willing to help people. Yes, I was fuzzier back then, and colored lenses were in. The round tray wasn’t as shiny as hoped in the photo, but you get the idea…. When our friends Ellen and Brian’s wedding day turned out to be largely not what they wanted (for reasons that would be way too long to get into here), Hope and I hatched the idea of marrying them again in our back yard–Wayward Friends style. The yard was decorated, the wedding processional was the theme from Star Trek, the groom was dragged to his place by his brothers, and Mark served as co-officiant, in a black leather jacket in the middle of the summer, with a bandanna and sunglasses. (While he kept saying that he wasn’t hot in the jacket when we asked if he was OK, he later confessed that he got heat stroke that day.) The “service” was a series of jokes largely based upon Monty Python and the Holy Grail. Mark’s reading from the “Book of Matrimony” (a la the Book of Armaments) about the feasting “on lambs, and sloths, and ocelots, and orangutans, and fruit bats…” was wonderfully memorable, as was his walking down the aisle blowing bubbles with a little bubble wand. Unfortunately, many of our memorable photos of Mark are currently buried in our attic, and so are beyond my ability to share them at this time. When Mark moved away, we missed him a great deal, though we were happy that he was following his heart and going to live with the man that he loved. 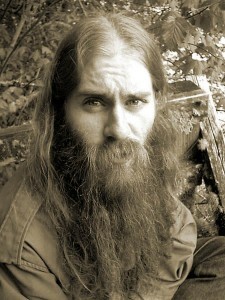 It also gave me the opportunity to get a feel for people who were potential new friends by seeing how they reacted when I talked about my friend who had “moved to Tennessee to live with a man named Goat and a goat named Rasputin.” Those with trouble adjusting to the concept never seemed to make the cut. We always worried about Mark living in the back woods, where medical help might be difficult, but Mark was hardier and fitter than most of us despite the CF, and did just fine there. And when he moved to Oregon and spent his early time there living in Glacier’s yurt? No worries. Mark was fine there. It was harder to keep in touch with him living so far away, and with our lives becoming more complicated back home, but we thought of him often and always hoped that he was doing well. We were able to see him during a visit to California back in 2001, when he came down from Oregon during our trip while we visited with Beth and Eric, and it was wonderful to spend time with him again. We didn’t see him again until this August, when our original plans to visit him in Corvallis were derailed by him catching a cold and ending up back in the hospital about a week before we were due to go out. Mark contacted us and apologized for disappointing us, but we told him that we didn’t really care where we got to see him, as long as we got to spend time together. Hope, Josh, and I changed our hotel from Corvallis to Portland to make it easier to get to the hospital, and headed on out. While we didn’t get to explore Oregon with Mark as we had hoped, being able to spend those precious hours with him in the hospital were priceless. It felt just like old times as we fell back into our familiar conversational patterns, and even Josh was able to fall right in as well. We brought him a T-shirt from our visit to Powell’s to give him more of a selection of what to wear, and a poster of the stars of the night sky from the Oregon Museum of Science & Industry so he could get a look at the stars even if it was foggy outside the window of his hospital room. There was so much that we talked about, and yet there was so much more to say. Even though he appeared to be improving, and indeed he went home from the hospital–albeit briefly–after we left, we inwardly knew that it would most likely be the last time that we saw him. 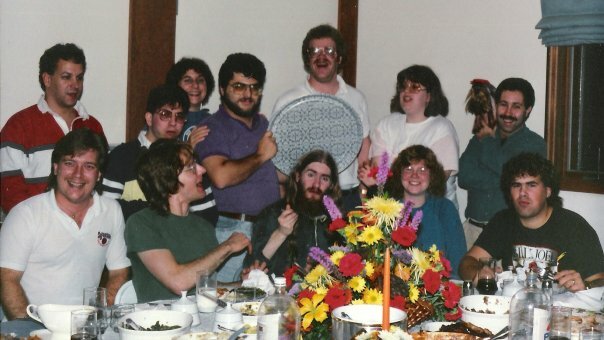 It’s kind of hard to sum up someone that you’ve known for over 28 years, even when you really didn’t see much of him after the first decade or so, but Mark was a very unique individual. And I stress the word individual. He was fiercely himself (and continues to be, as of this writing, though for how much longer I’m not sure), and was himself and self-aware in ways that many who live to twice his age could never hope to be. Again, Mark was able to–despite his fragility–be stronger than everybody around him. I’ve rambled on far longer than I planned, but it’s late at night and my brain is running unchecked. I’ll wrap it up now. For those reading this from my regular blog feed that don’t know Mark, I encourage you to find out more about him by reading his CaringBridge site, his brief autobiography on his old website (and then explore his writings there), and a tribute to him from our friend Beth. Lars, I know that you’re reading all of these posts to Mark, and I’m very glad that you’re there for him. It was good to meet you while we were out in Oregon, and to know that you would be there to help Mark through this difficult time. Thank you for being a good friend to Mark. And Mark, thank you for being you. You tremendously enriched our lives with your presence, and have been a shining example of what people could be, despite limitations unfairly placed upon them. We miss you, and we love you. Thank you, Mark. I especially loved the last bit. I’m really glad you guys got to see him recently. There were 4 Marks in that thanksgiving photo. I would call out “Mark!” to come help in the kitchen and always got the wrong one. So rather than call EVERYONE Mark to avoid confusion….they became Snark, Mongo, Robarge and Mark forevermore. ( yes, we did a LOT of Monty Python around the table). Snark was so patient with all of us that day. A wonderful tribute and memories of a person who is more alive than most people will ever be. Mark never let his medical condition define him or his limits. He challenged me and expanded my knowledge of music, art, mathematics, philosophy, science, religion… more than any other single person I have ever met. On my best days, I could grasp a piece of what he was saying. His ‘goodbye’ email was thoughtful and worded to help ease my acceptance of his leaving this world. May the mysteries of the universe be revealed to you in your final hours.